The United States Congress designated the Salmon-Huckleberry Wilderness (map) in 1984 and it now has a total of 62,114 acres. 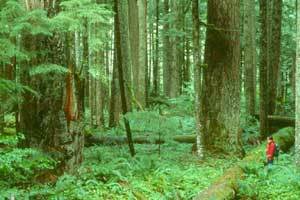 All of this wilderness is located in Oregon and is managed by the Forest Service. The Salmon-Huckleberry Wilderness is bordered by the Roaring River Wilderness to the south. The main attraction in this Wilderness, the Salmon River provides excellent habitat for steelhead and chinook and coho salmon. The drainages of the South Fork Salmon River and Eagle Creek stand cloaked in a dense rain forest of Douglas fir, true firs, western red cedar, and western hemlock with a thick understory. Volcanic plugs, pinnacles, and cliffs distinguish the area's sharply dissected ridges. Much of the water in this area runs off of Huckleberry Mountain in the northern portion. To the south is Salmon Butte, a striking 4,877-foot landmark with a fine view from the top that can be reached by trail. Mule deer and black bears find winter range hidden in the area's wild off-trail country. The Salmon River National Recreation Trail cuts through more than 12 miles of this Wilderness, part of a trail system that totals about 70 miles. Maps typically imply that this trail parallels the river, but it actually travels several hundred feet above the banks, except for a couple of miles at the lower end of the gorge. At least five trails begin with long climbs and trace ridges with panoramic views, including the Wildcat Mountain Trail (five miles), which is probably the easiest to access. Although close to the Portland-metro area, and just across the highway from the popular Mt. Hood Wilderness, much of the Salmon-Huckleberry Wilderness has very little use and outstanding opportunities for primitive recreation and solitude, even on weekends. Planning to Visit the Salmon-Huckleberry Wilderness? How to follow the seven standard Leave No Trace principles differs in different parts of the country (desert vs. Rocky Mountains). Click on any of the principles listed below to learn more about how they apply in the Salmon-Huckleberry Wilderness.